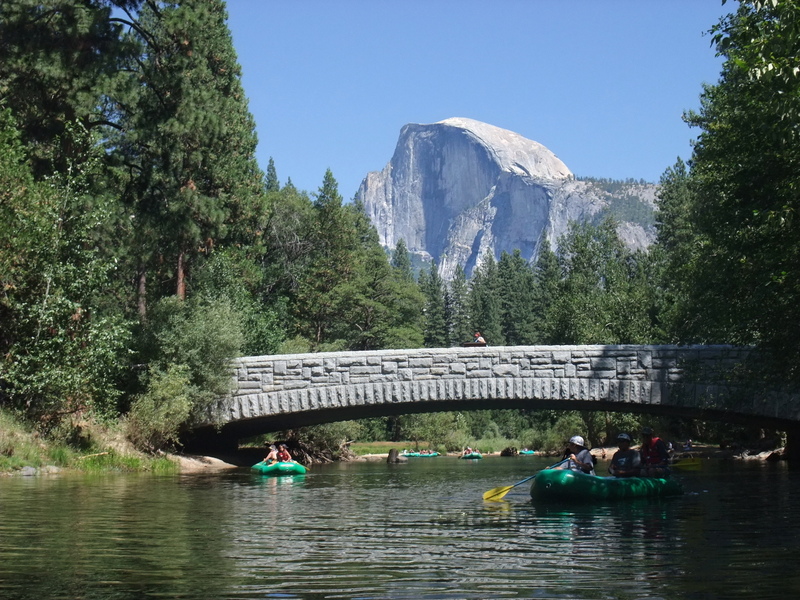 The Merced river thru Yosemite Valley is one of the most beautiful floats in the world, with glimpses of Half Dome near the beginning and intimate views of El Capitan near the end. The paddling is not difficult, but you might get a sore neck from looking up at the scenery. 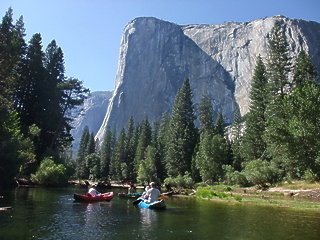 The trip usually goes quickly because of fast current, although things slow down near the end. 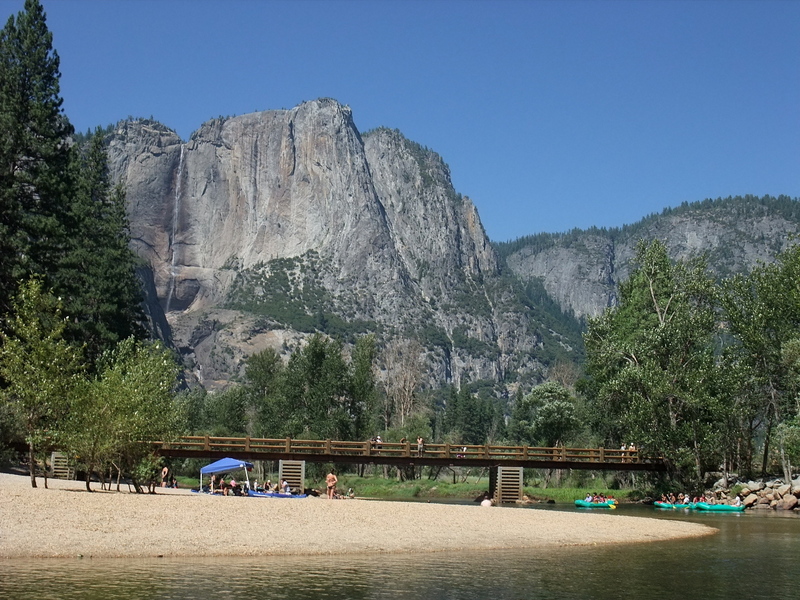 The National Park website for floating the Merced River in Yosemite Valley says you can boat only from Stoneman Bridge to the Sentinel Beach Picnic area, not from Pines Bridge to El Capitan Bridge (2007). This regulation, if enforced, makes the float much shorter, around 3 miles. 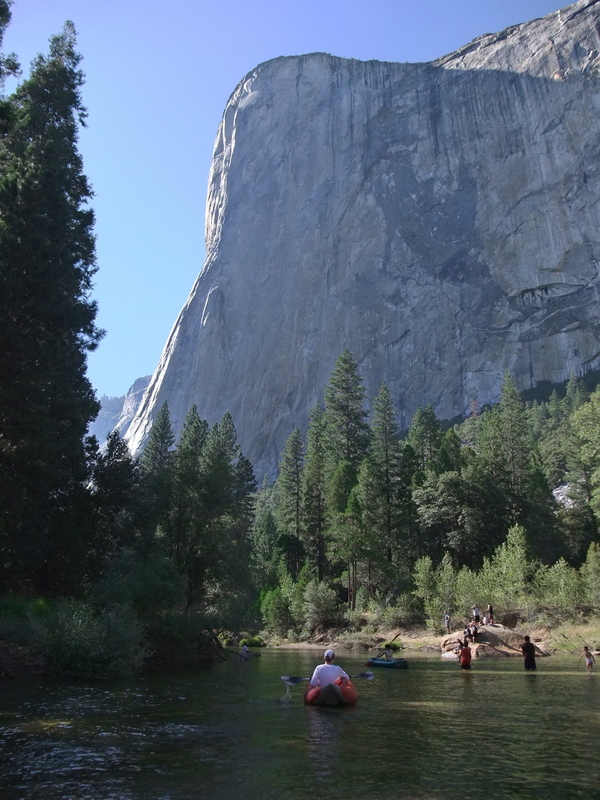 However many boats floated past there to El Capitan bridge, where crowds are thin and parking is plentiful (2010). This is a national park with entrance fee, $20 in 2010. 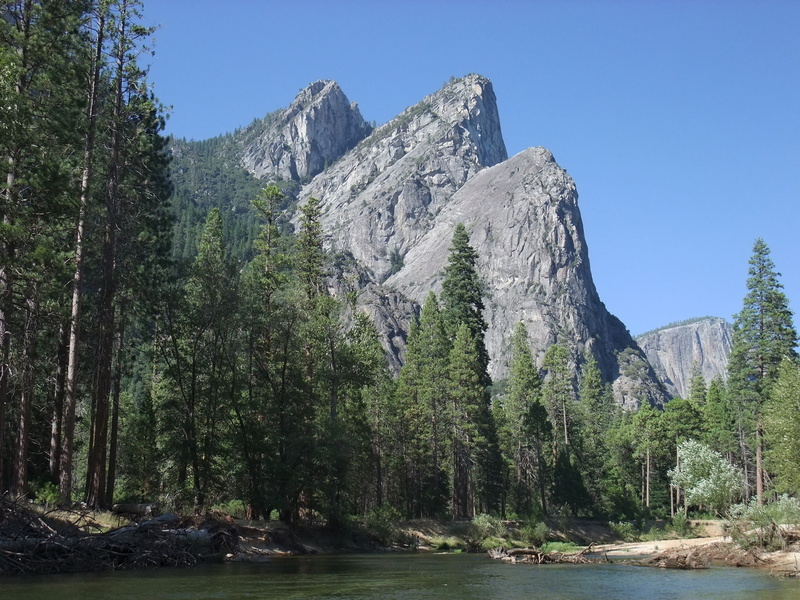 Yosemite management plans call for the eventual elimination of private automobiles from the valley. Hopefully shuttle bus service will continue to support this run. Camping in Yosemite Valley requires reservations well in advance, but primitive camping is available on river right below Briceburg, and across the river from highway 140 below El Portal. 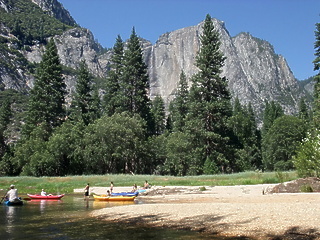 Put in just below Pines Bridge on river right. 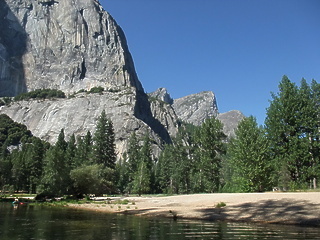 A sandy area with scattered trees slopes down to the river. Fast water begins immediately. 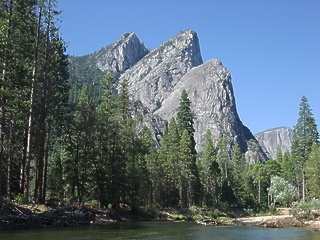 Tenaya Creek comes in on the right. 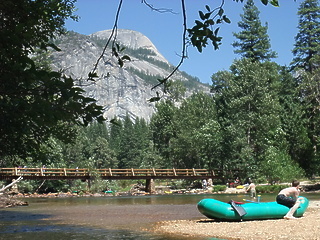 A pedestrian bridge soon crosses the river at mile .5 and again at mile .7 near the Ahwahnee Hotel. River passes under Stoneman Bridge where the one-way road crosses from southside to northside. A concessionaire rents rafts nearby. 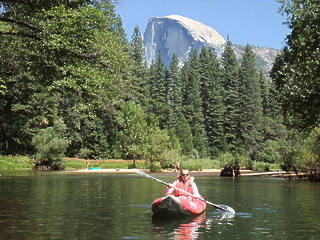 Alternate put-in, and normal raft put-in. Current starts to slow. 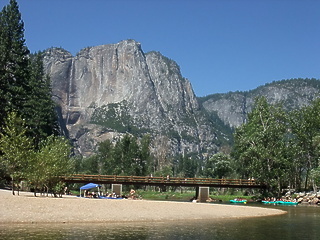 River passes under Sentinel Bridge, which connects Yosemite Village headquarters with southside. Slots (class II-) underneath a pedestrian bridge provides a bit of maneuvering practice. Try to avoid hitting your boat on rocks. 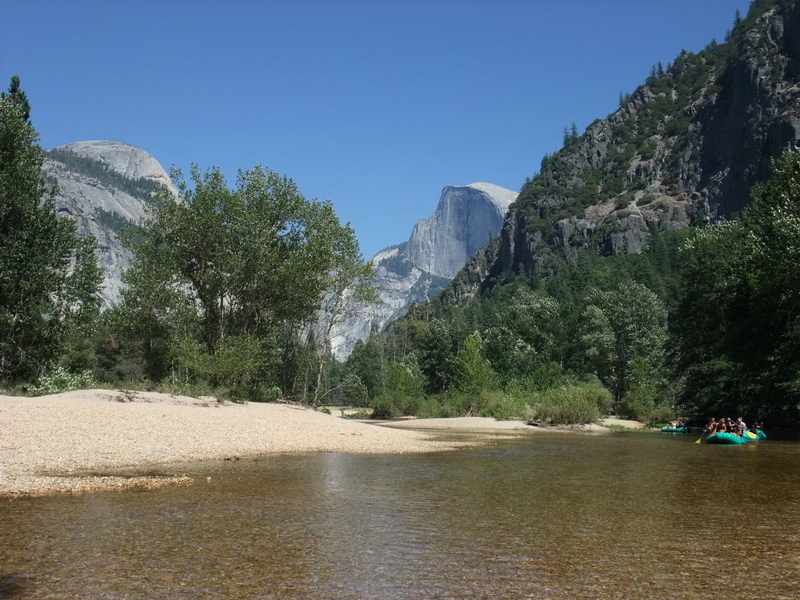 Yosemite Creek comes in on the right, and the current slows down. River enters a series of meanders with few rapids. Another pedestrian bridge, the last before take-out. 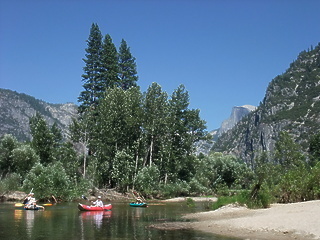 The river enters a series of meanders and goes around islands. 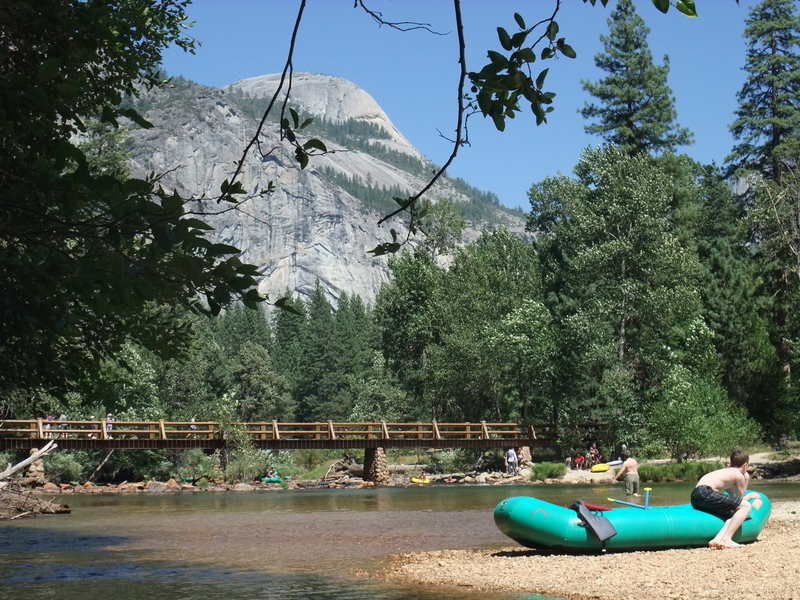 Sentinel Beach Picnic Area, where rafts rented from the concessionaire always take out. The river slows down more, and solitude increases. You might spot a bear in this section. One-way roads are close to the river on both north and south sides. Parking lot on right bank where people come to view El Capitan. River comes close to embankment for northside one-way road. Down trees in river. Take out underneath El Capitan Bridge, which is easiest on the left bank. 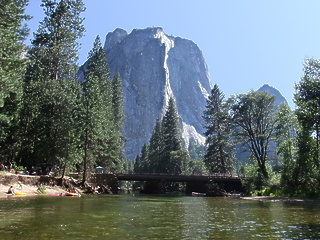 Below, the rapids soon become class III-IV, then V-VI as the river spills out of Yosemite Valley beyond the dam at the Arch Rock entrance station. 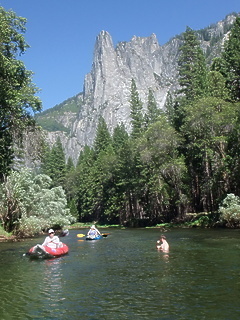 Well downstream of this stretch, below the park boundary, lies an excellent class III-IV run, the Merced River below El Portal. 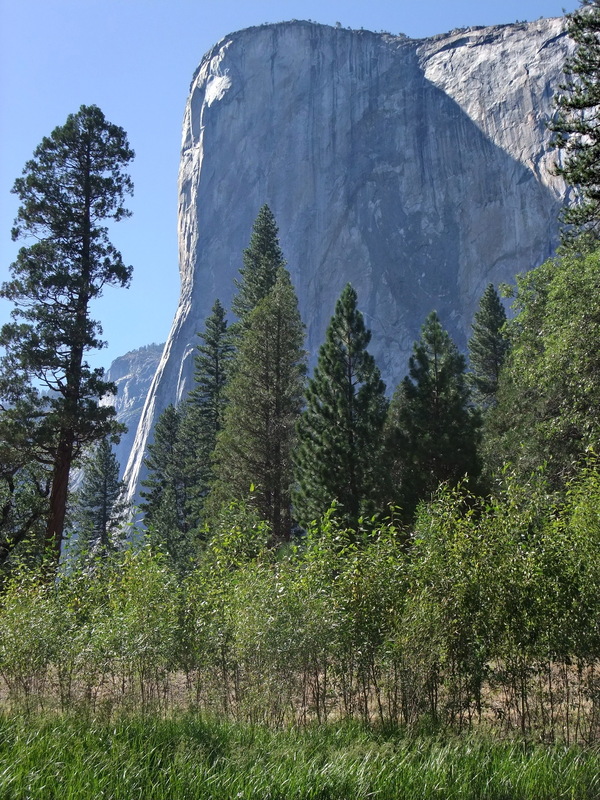 To reach take-out, pay your park entrance fee and proceed on the southside one-way road past Bridalveil Falls. 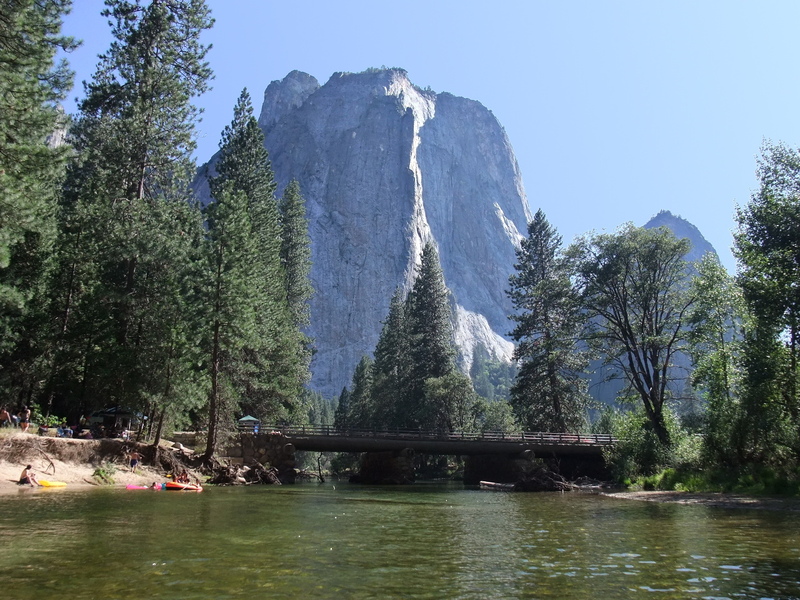 After views of El Capitan, take the next left and park one vehicle near the Depression-era stone bridge across the river. If you have only one vehicle, it is possible to catch the shuttle bus by returning to the southside one-way road (leave your vehicle at take-out because you might be cold at the end of your trip). To reach put-in, return to the southside one-way road and drive to the 4-way stop sign near Curry Village. Parking for the alternate put-in at Stoneman Bridge is nearby. For the higher put-in, proceed straight thru the intersection, curving right thru the woods. Follow signs to the stables and cross Pines Bridge. If you get an early start, parking is usually available near the stables.